Get Discount on 2+ hours. Call 1-815-715-5105. See how good our Chicago area face painters are with kids and with creating unique, fun face painting designs. More upcoming public events to be listed here soon. In the meantime, check out the following examples of Chicago area public events and retail store promotions for which we’ve been hired to do face painting and/or balloon twisting. Hire our artistic face painters for kids entertainment at your community event, company picnic, grand opening, tent sale or kid’s birthday party. Your guests will be impressed. And the face painting photo memories will last a lifetime. We use Snazaroo face paints, the finest quality face and body paints in the world, imported directly from England. The colors are bright and rich. They won't irritate skin or stain clothes. And they easily wash off with soap and water. The Snazaroo face paints we use are not only approved by the FDA, but they are the only ones in the world to be awarded the Child Safety Rating, which has guidelines that are stricter than the FDA's. Artistic quality face painting at prices that can't be beat. Our face painters are true artists, ensuring that you get the best quality face painting for your money. The smiles, pictures and memories will make you look like a genius for choosing Artistic Face Painting to entertain your party guests. To make your decision even easier, for a limited time we are offering discounted rates on face painting and balloon sculpting services (min 2 hours). Contact us today! Friendly. Courteous. Fun. Artistic. That’s who we are. Debbie Adler founded Artistic Face Painting in 2006 with a very clear mission… to help transform ordinary parties and events into magical and memorable celebrations. That’s why she only hires truly artistic face painters who are not only passionate about their art, but are also passionate about making people smile. – Artistically trained face painters. – Great with kids, teens, and adults. Debbie has 10 younger siblings, 5 children of her own, and is a doting aunt to 25 wonderful children. Needless to say, she knows what it takes to make a kids party fun & memorable. Ask her for fun kids party entertainment ideas. We serve the entire Chicago and Joliet metro areas. No matter where you are in Chicago or its suburban areas, we’ve got expert face painters. For example, we offer the best face painting services in Algonquin, Arlington Heights, Barrington, Bolingbrook, Burr Ridge, Carpentersville, Crystal Lake, Deerfield, Downers Grove, Elgin, Elmhurst, Evanston, Frankfort, Grayslake, Hinsdale, Homer Township, Homewood, Joliet, Kankakee, Lemont, Libertyville, Lisle, Lockport, Manhattan, Midloathian, Mokena, Naperville, New Lenox, Northbrook, Oakbrook, Orland Park, Palatine, Palos Heights, Palos Park, Plainfield, Romeoville, Schaumburg, Skokie, Tinley Park, Woodstock, and more. We also serve northwest Indiana. We now have a face painting branch offices in San Jose, California and Kenosha, Powers Lake and Randall Wisconsin. Top quality face painting plus service with a smile! We are committed to helping make your event a huge success. 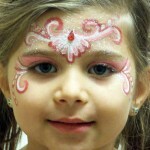 So you can count on us to impress your guests with great face art and endearing charm. See testimonials. – All types of private, community, and business events. – We use the most expensive, top quality face paints. – Prices that beat clowns, magicians & other face painters. – We offer craft projects as a party entertainment idea. – Ask us about our balloon sculptors for added party fun. – Free quote. Contact us with your party details & ideas. Our founder Debbie’s first employee was her eldest daughter, a college art major. As the business has grown, Debbie has gone out of her way to keep that humble, family-run style of personal service and helpfulness.